Solarbuzz recently reported that world solar PV power capacity grew by a record 9,000 megawatts (MW) in the 1st quarter of 2014. However, that record isn’t likely to last long. 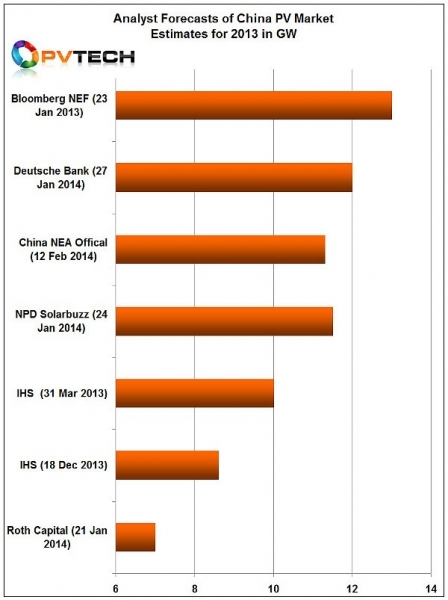 The solar market research company forecasts that every quarter this year will be higher than the one before it. At the end of Q1 2015, Solarbuzz forecasts that the 12-month total will be over 50,000 MW! 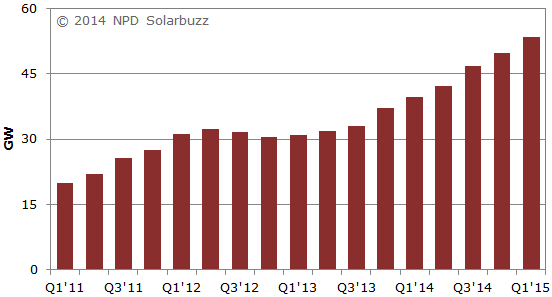 For 2014, Solarbuzz is maintaining its forecast of 49,000 MW. However, it wouldn’t be surprised to see the world surpass that. Meanwhile, another market research firm, IHS, just raised its 2014 forecast to 46,000 MW following the strong 1st quarter. That would equal a 22% increase in the market compared to 2013, IHS notes. The main countries driving global installments during 2014 are widely projected to be China and Japan. The 1st quarter of the year tends to account for 20% or less of the year’s total. Solar manufacturers got slammed with financial difficulties in recent years as supply ramped up a great deal and far surpassed demand. However, many of the big players are back to making a profit and have survived that challenging period. Strong demand growth will only further improving their financial security. Getting back to IHS, the market research firm projects that China will install a record 12,800 MW in 2014, more than almost any other country will have in total at that time. And that’s about 29% more than the 10 GW that was projected just last year. 8,000 MW of that are supposed to be ground-mounted projects, while the other 4,800 should be distributed rooftop solar power systems. However, it should be noted that there are a number of analysts who don’t think China will be able to log so many rooftop solar power systems. We’ll see. While the strong 1st quarter may very well have been at play in the revised IHS forecast, the company actually focuses on Chinese announcements as being an important reason for the change. Notably, mis-forecast China’s 2013 growth. Indeed, IHS has previously been sceptical of China’s goal of meeting government targets of around 10GW in 2013, forecasting installations of around 7.5GW. However Chinese officials had said installations had exceeded 10GW late last year, while NPD Solarbuzz estimated installations had reached over 11GW. IHS was not alone in massively missing the installation growth in China last year; Bloomberg New Energy Finance (BNEF) undertook a complete u-turn earlier this year, conceding that China was expected to beat Japan in PV installations in 2013, forecasting that China had installed around 12GW in 2013. However, IHS noted that weakness expected in the Japanese residential market would be more than compensated for by the strong commercial rooftop market. 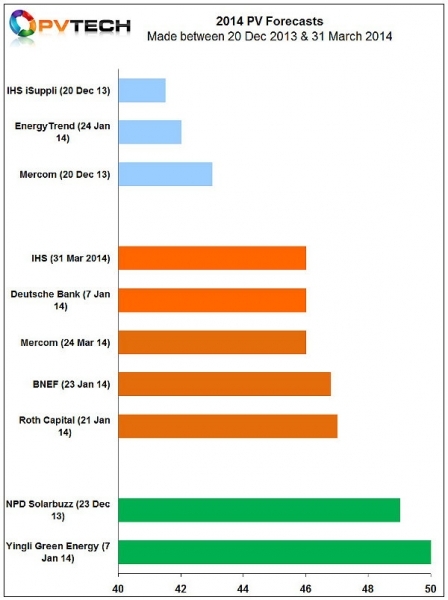 Despite changing forecasts for 2014, IHS is sticking by its medium-term forecasts. While government policies are still important for solar growth, more and more regions are reaching or approaching incentive-free grid parity. Once that is the norm, solar forecasting might get a bit simpler. On the other hand, that could make forecasting even more difficult. Government targets and policy limits are fairly easy to follow, but what will happen when consumers see solar as a no-brainer even without government support?